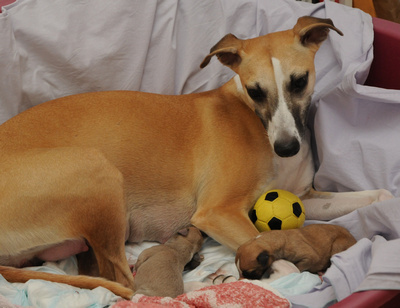 Geena gave birth to one handsome boy and one beautiful girl. 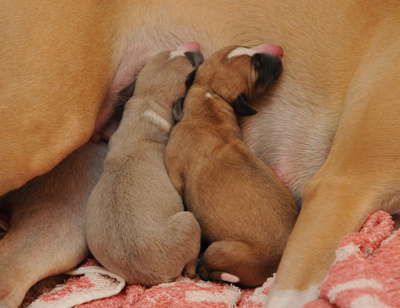 Both the mother and babies are doing fine. 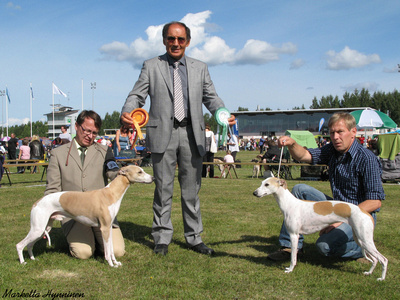 Niilo's son Masik, Intriga'S Drive CACIB, BOB and BIG-I! 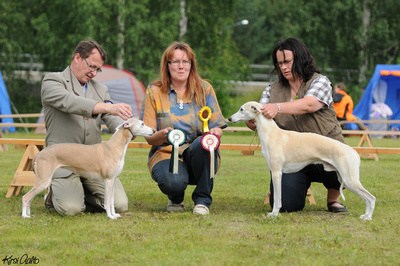 23.9.2011 Happy birthday Hertta & sisters Nuka, Hymy & Tsumba - 8 years! 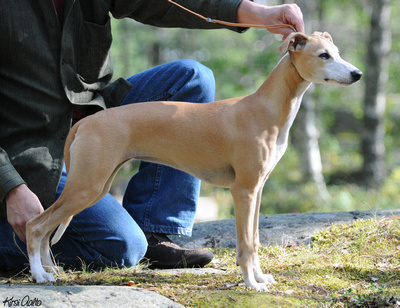 21.9.2011 Happy 5-year-old birthday to Honey's kids Ada, Honda, Taikku, Tiku, Paavo, Petteri & Speedy! 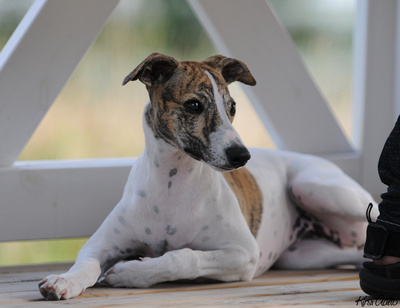 18.9.2011 Happy 5-year-old birthday to Hertta's kids Namu, Juuso, Nemo, Soni, Sisu & Sulo! 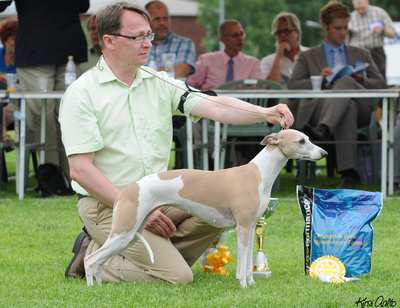 Time really flies, heartfelt congratulations! 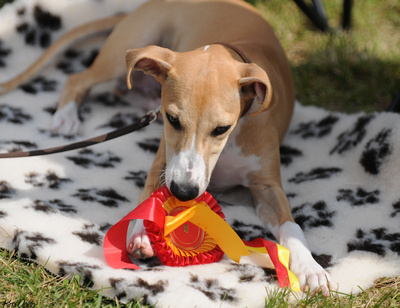 Congratulations to Gilda's home team! 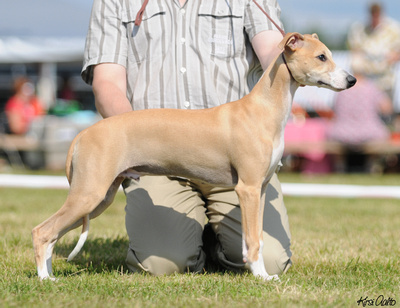 Mickey, Int Ch Whiptails Sky’s The Limit has now veteran champion titles BALT EE LV LT VCh. 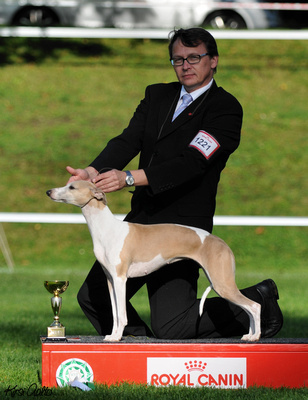 Congratulations to Mickey's home team! 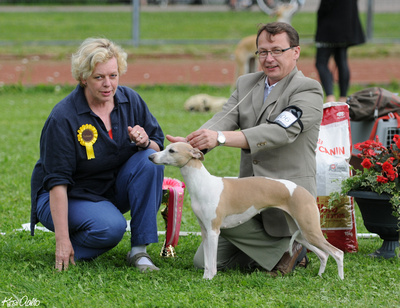 Whippets were judged by Gabriela Veiga, Portugal. 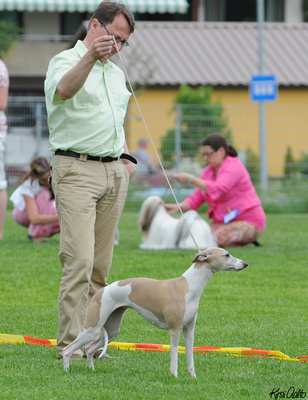 Group was judged by Robert Blümel, Austria. 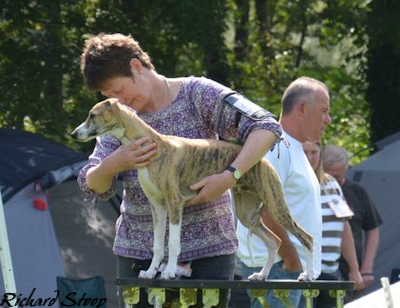 Honey was shortlisted among the 6 best veterans in the BIS-veteran competition. 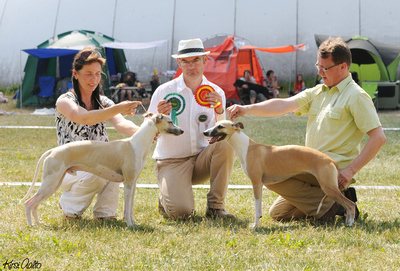 Whippets were judged by Giuliano Biasiolo, Italy. 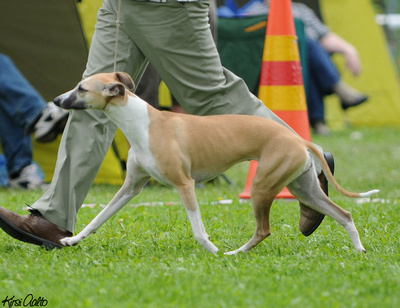 Group was judged by Gabriela Veiga, Portugal. 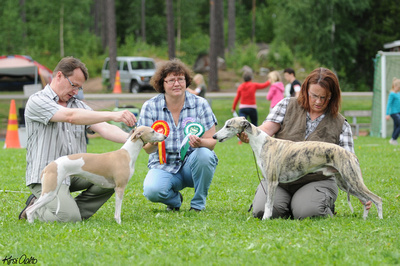 Congratulations to Juuso's home team, way to go! 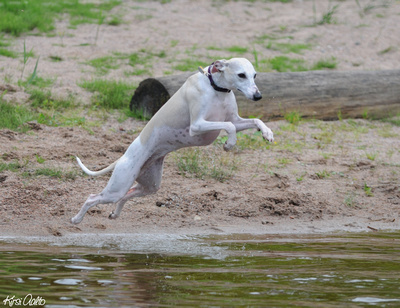 25.7.2009 Happy 6-year-old birthday Emil, Ida, Kille, Salttu and Wili! 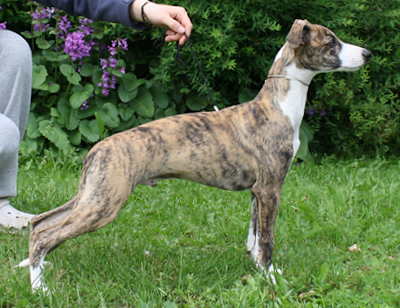 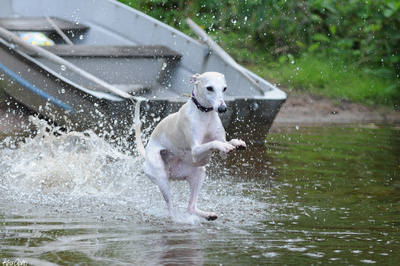 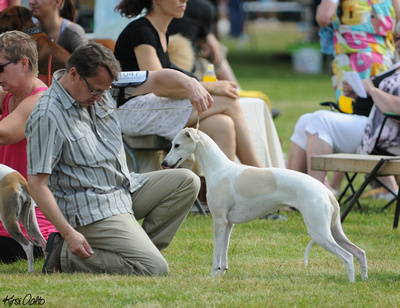 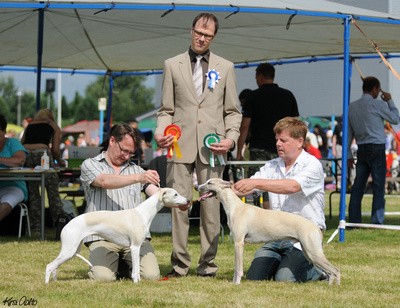 Whippets were judged by Michael Forte, Ireland and group by Lars Adeheimer, Sweden. 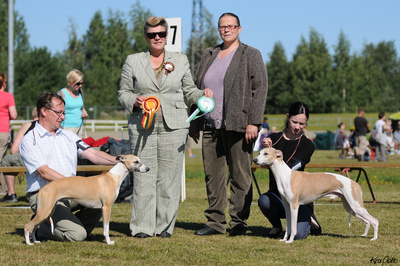 Whippets were judged by Pirjo Aaltonen and group by Outi Piisi-Putta. 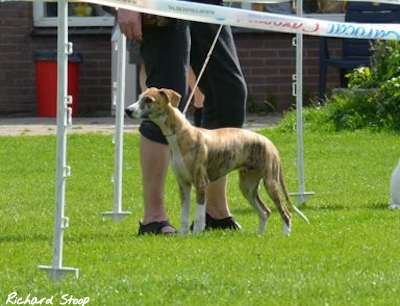 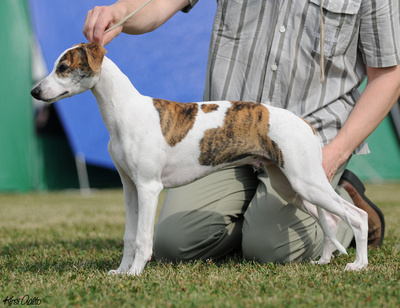 Turo, Whiptails Miracle Mac participated little puppies, 3-6 months old class (with 20 dogs entered) and he became 1st! 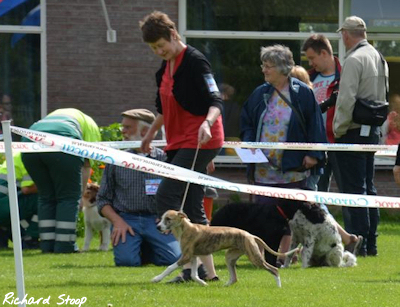 What a good start, congratulations! 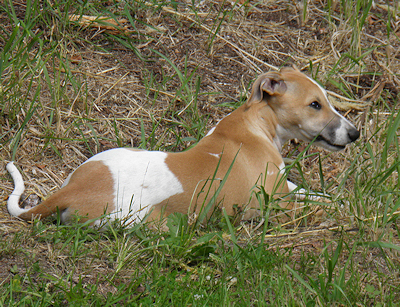 We proudly present new photos of these 14 weeks old boys, looking really promising. 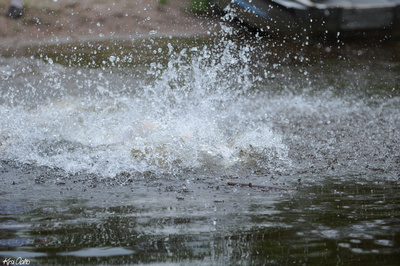 A lot has been happening in the show scenes this weekend. 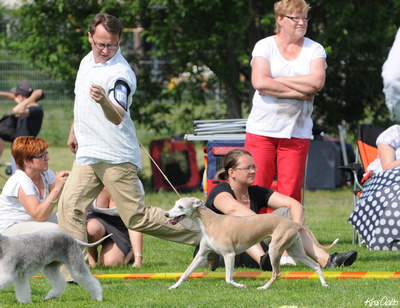 Members of Whiptails team have participated many shows this weekend, both in Finland and abroad with great results. 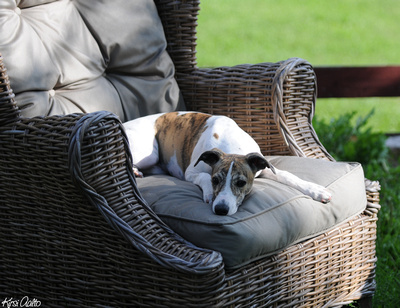 Thanks for everyone for the activity! 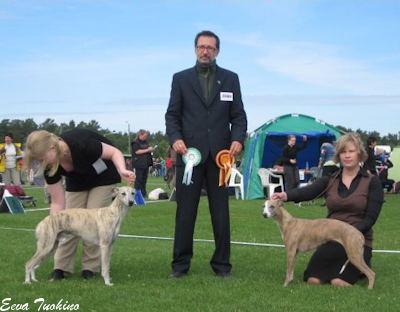 The results from the events are shown below. 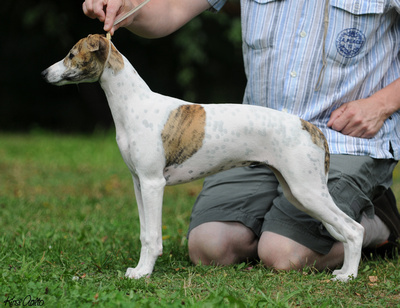 Mickey, Int Ch Whiptails Sky’s The Limit become LT vet Ch on Saturday and on Sunday LV vet ch. 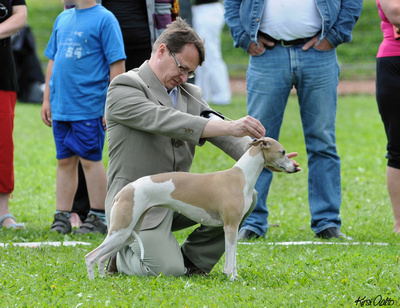 This makes him now also Baltic Veteran Champion. 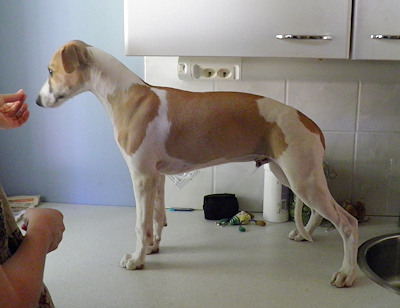 Mickey has now been BOB veteran 6 times in a row. 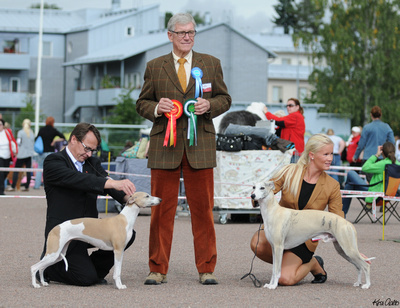 Heartfelt congratulations to Pirkko and Timo! 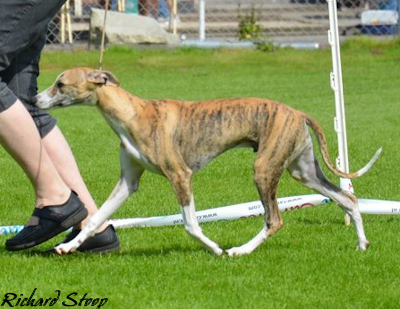 Honey, Ch Peperone Partyline moving in the BIS-veteran ring. 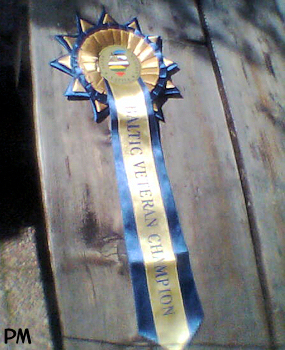 She was shortlisted among the 8 best veterans but was not placed. 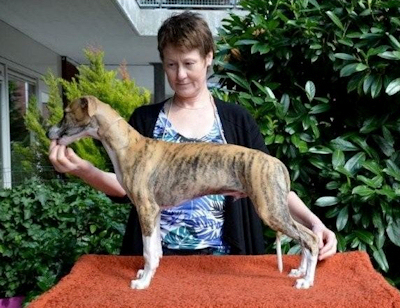 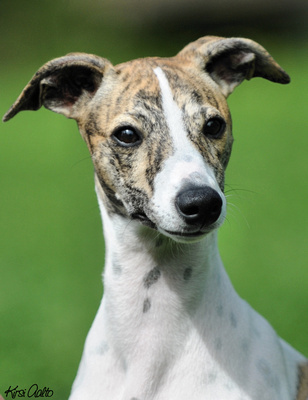 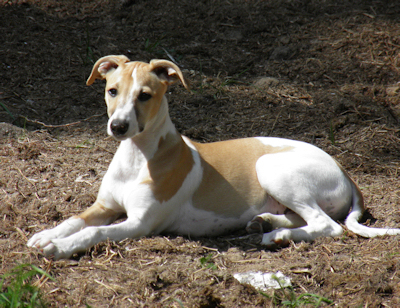 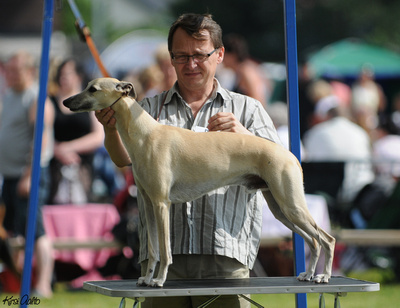 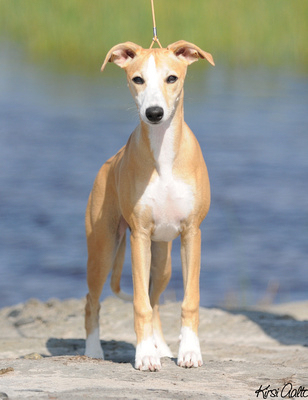 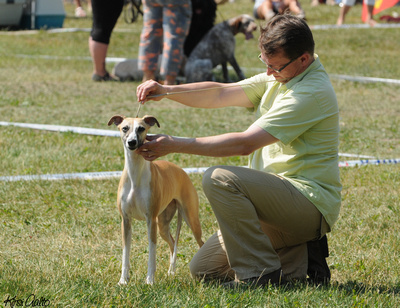 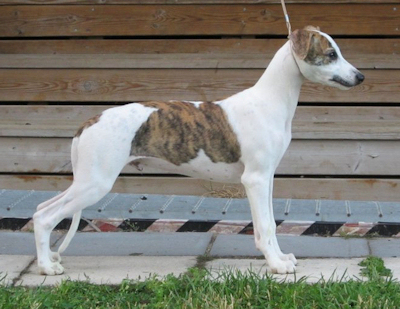 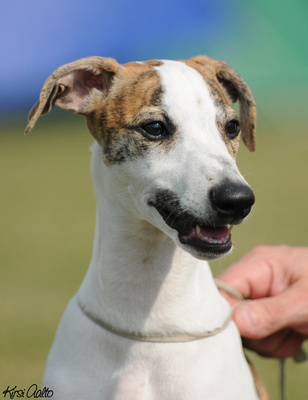 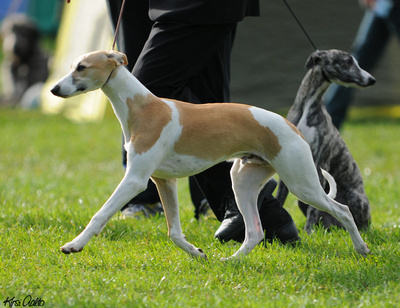 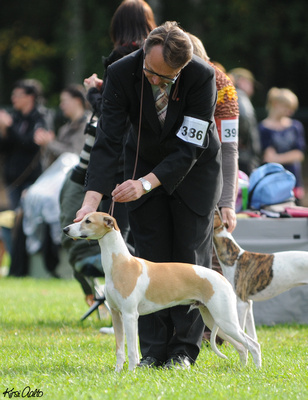 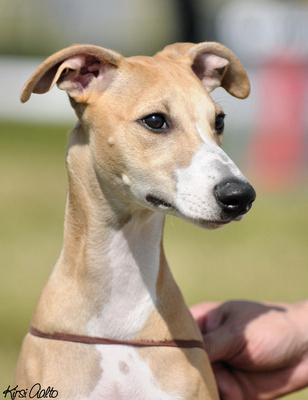 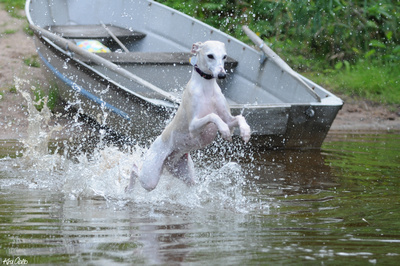 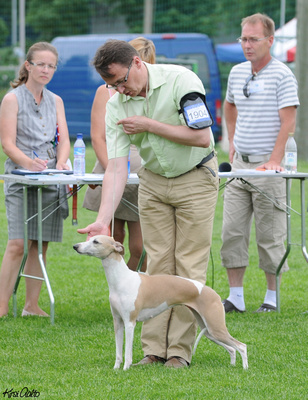 Whippets were judged by George Kostopoulos, Greece. 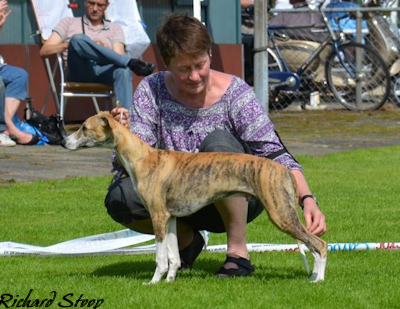 Honey's granddaugheter, Hilla's daughter Vattis, Hookoplan Harmattan was BOB and BIG-3. 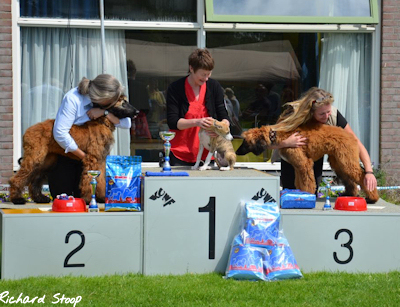 Heartfelt congratulations to all involved! 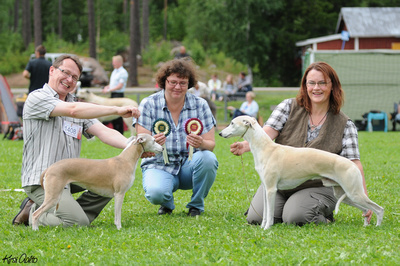 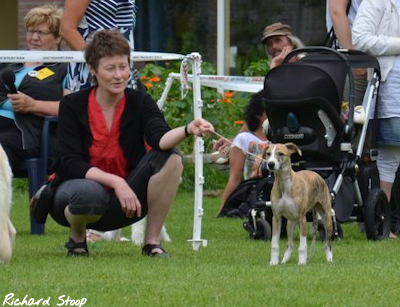 Whippets were judged by Svante Frisk, Sweden and sighthound group was judged by Maria Teresa Durando, Italy. 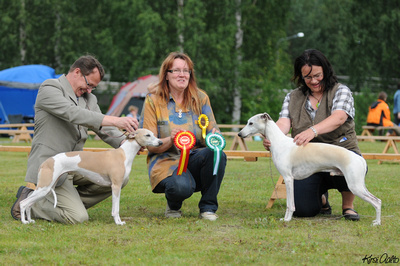 Petteri, Whiptails Champs Elysees EXC/1 CQ in open class, 3rd best dog, CC, New Finnish, Estonian and Latvian Champion. 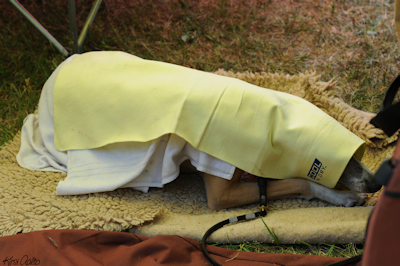 Petteri resting under the cooling towels inside our tent during the show day. 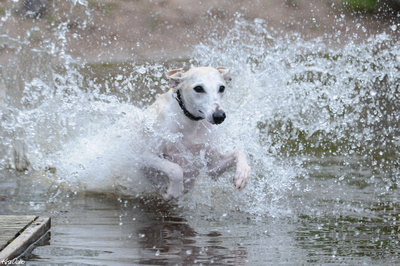 This photo describes quite well how hot the weather was!